Since the release of The Legend of Zelda on the NES in 1986, the primary means of combating enemies has been the swordplay of the protagonist, Link, and as the series progressed, so did his fighting style. 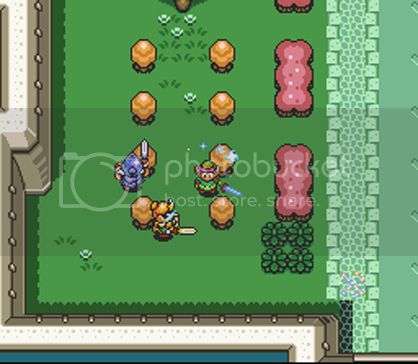 As such, the development of swordplay in the Zelda series has had a powerful influence on the development of the manner in which the games are played, as I shall now outline in further detail. In any form of swordplay in any part of the world, there are two central aspects that make up its primary focus: footwork and bladework. The former is often considered the more important of the two; without it, the fighter lacks the ability to maintain his balance, attack, defend and evade effectively. This carries over into the Zelda series to a certain degree. 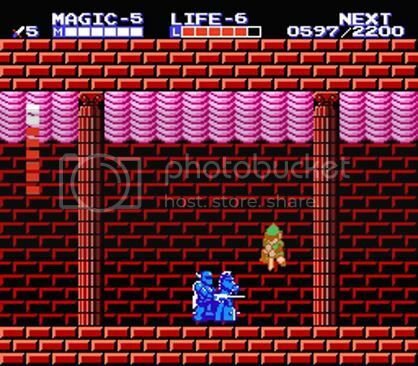 In the 1986 original, Link’s swordplay was extremely primitive. Combat took place on the Overworld, from a bird’s eye point-of-view, each area swarming with free-roaming monsters. Link could only move in four directions, perform a single forward thrust with his sword and defend against missile attacks directly in front of him with his shield when he himself was not attacking. As he attacked, he was unable to move, and his limited movement made it difficult to evade the attacks of enemies. To counter this, Link had the ability to fire beams from the tip of his sword while at full health. 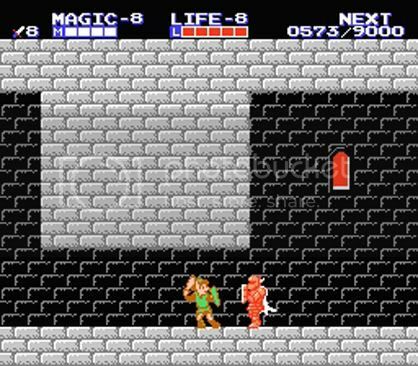 These beams had unlimited range, equaled the power of the sword equipped and could pass through obstacles, thus allowing Link to attack from a distance while covering himself effectively. 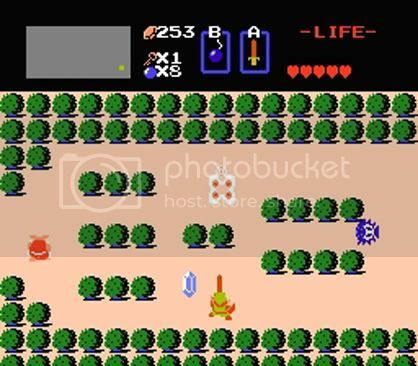 As such, a large number of players, especially younger players who grew up with the 3D titles, would tend to maintain distance from the enemy, guarding their health so as to retain their long-range advantage, or failing that, rely upon other long-range weaponry from Link’s expanding inventory, such as the Bow or the Magic Rod. It seems to me that the developers became aware that this essentially removed the element of swordplay from the game, and developed the 1989 sequel with this in mind. The Adventure of Link (NES) is one of the most controversial incarnations of the Zelda series due to its drastic change from the style introduced in the original to an action-RPG platforming hybrid. All evidence suggests that swordplay was intended to be the central focus here, as all other aspects from the original that served as alternatives to swordplay had been either restricted or removed altogether. There was no longer an inventory of secondary weapons, which had been replaced by an arsenal of magic spells, the once mighty Sword Beam’s range was limited, only traveling only a short distance before dissipating, and affected only the weakest of enemies, and an RPG style leveling system was introduced, ensuring that players had no choice but to engage in melee combat in order to grow more powerful. In addition to this, all combat now took place on a side-scrolling ‘Action Screen’, allowing for more versatile sword-fighting. Link’s forward thrust could be executed more rapidly, his shield now also guarded against melee attacks and protected him even while performing attacks of his own, and he could crouch, allowing him to attack (and guard) high and low, as several enemies followed suit. In addition, for the first (and only) time, Link had the ability to perform unassisted voluntary jumps, and this, too, contributed to his swordplay, with addition of aerial techniques, the Upward and Downward Thrusts, acquired later, as well as his standard aerial forward thrust. Footwork also plays a larger role, as many different enemies engage Link in duels with swords and shields of their own and maintain distance between Link and themselves. As Link advanced, they retreated whilst facing Link, counterattacking when his attacks fell short, an ability he himself lacked, having to turn his back on his opponent to retreat. This proved to be a disadvantage, and forced the player to be quick on their feet in order to attack effectively while also escaping harm. By tactical standards, the swordplay in AOL remains unmatched by most of its 3D counterparts in the series. However, having said that, the game was also much more difficult than most others in the series. Many were unable to adapt to the sword-fighting engine, and thus succumbed to the advanced AI of the enemies. The magic system also provided little combat assistance, as the majority of the spells served only to pass certain points of the games, and their high magic consumption, as well as the lack of magic refills, prompted most players to conserve their magic, relying primarily on the Shield and Life spells in emergencies in order to avoid death. This, coupled with the aforementioned lack of alternatives to swordplay, left a huge number of fans disheartened, and many gave up early on, unable to complete even the first palace. Considering the success of the original and the controversy surrounding the sequel, the two games essentially served as experimental phases for the developers, as the sequel that followed in 1991 was to set the standard for the remainder of the series. A Link to the Past (SNES) is considered a breakthrough installment in the Zelda series, as it finally achieved the balance that fans of the two previous titles had hoped for, returning to the original gameplay style while also augmenting the combat and magic aspects from the sequel. The bird’s eye view made its return, the inventory and magic system were merged into one, and the more powerful console allowed for a more advanced control system. Link could now move in eight directions, and his standard sword attack was no longer a forward thrust, but a horizontal back-handed slash. This meant that he could evade more effectively, and his range of attack was increased from a single point to an arc. Once again, his shield could only defend against missile attacks, but he now had the ability to move while facing in one direction, allowing him to guard while moving. The Sword Beam returns once again, not initially available but acquired with a more powerful sword. Its range was unlimited, but could no longer pass through solid obstacles, and its power was fixed to the first sword level, once again showing the developers’ intent for the player to become more comfortable with melee combat. 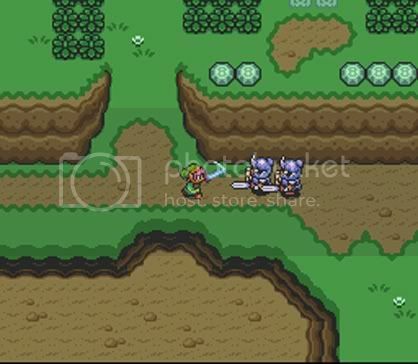 However, it would appear that the developers realized that these advancements alone would not be sufficient to make ALTTP shine above its predecessors, and this, it would seem, may have led to the inclusion of a technique that revolutionized (if you’ll pardon the pun) the player’s approach to the game: the Spin Attack. Originally known as the ‘Whirling Blade’ technique, the Spin Attack consisted of a full circle slash attack that dealt twice the normal damage to all enemies in range after first focusing power into the blade. While preparing the technique slowed Link’s movement and left him briefly vulnerable, some application of skill allowed the player to effectively defend on all sides. The attack was as awe-inspiring in appearance as it was in strength, at last making melee combat appealing to those who were previously reluctant to engage in it. 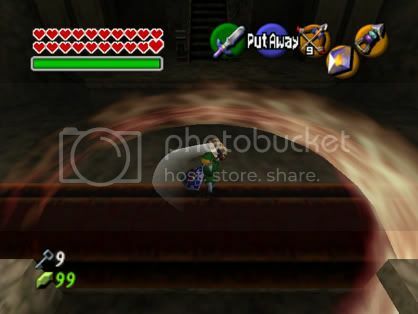 In fact, mastering the Spin Attack is crucial for playing through many Zelda titles, to the point that it has often been the most effective (and, in some cases, only) method of combating Ganon, the series’ trademark villain, upon introduction, and has since become Link’s signature move in all later installments that would follow. The remainder of the 2D Zelda titles, most of which occur on handheld systems, have followed the formula laid out by ALTTP, and with much success. The next mainstream console title would make another breakthrough, with the transition into 3D. The Legend of Zelda: Ocarina of Time (N64) is considered to be the best game in the Zelda series, and one of the greatest games of all time, by many gamers worldwide, mainly due to the manner in which it so successfully carried Link onto the three-dimensional plane. The control system was smoother than ever, thanks to the N64’s analogue stick and the ground-breaking new targeting system. At last, by locking on to a single target, Link could approach, retreat from and strafe around his enemy whilst constantly facing it. The sword could now be swung in many directions, combos could be formed, the shield could be used voluntarily against the majority of attacks, and Link was able to perform evasive jumping maneuvers and a powerful lunging attack, making for the most furious combat seen in the series thus far. 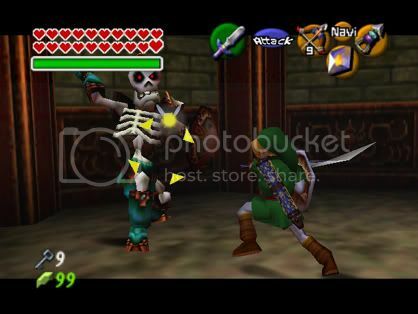 The now staple Sword Beam technique had been experimented with during the development stages, but was later excluded from the final game and all of the 3D titles that followed, save for its inclusion as a bonus feature for completing the mask collection in The Legend of Zelda: Majora’s Mask (N64). This single instance proved beyond doubt to players that the technique could not be worked into the 3D titles without drastically reducing the level of difficulty. For this reason, the Spin Attack received a powerful upgrade, using magic to increase its range and power, as well as make it appear more dynamic, which proved to be a well-received addition to Link’s arsenal. However, though all 3D console Zelda titles that followed made use of OOT‘s engine, each one attempting to expand upon and improve it, from this point on, gameplay seems to diminish for this very reason. While the development of sword-fighting had carried the series to a number of massive successes, too much emphasis on the visual aspect has resulted in the neglect of other features. A number of the recurring secondary weapons are becoming increasingly monotonous in the absence of innovation, and the enemy AI is decreasing steadily, reducing the overall difficulty of the games, and the veteran’s sense of enjoyment along with it. The Legend of Zelda: The Wind Waker (GCN) gave OOT‘s swordplay a refreshing cosmetic makeover with the inaptly named ‘Parry’ system, whereby pressing the action button an instant before an enemy attacked caused Link to evade and immediately counterattack in a variety of flashy maneuvers to the enemy’s openings. These techniques, initially available in TWW, were later adapted for The Legend of Zelda: Twilight Princess (GCN/Wii), in which they were acquired separately from a mysterious swordsman as the game progressed, and each technique could be executed at will, rather than an instantaneous counterattack. These advancements in the engine are both visually pleasing and effective against enemies, but one cannot help but feel that they are rather too effective, as the poor AI ensures that enemies do next to nothing in the way of defending themselves for their inevitable demise to give most veterans any sense of enjoyment or closure. It has become evident that swordplay has been made the central focus of gameplay in the Zelda series since the release of AOL in 1989, and this decision proved to fuel a roaring fire for the decade that followed. Since then, however, swordplay has received far too much emphasis, resulting in neglect of the enemy AI, and has now reached the stage where the enemy on the receiving end of Link’s blade is unable to put up a fight. One has to wonder if a return to the controversial AOL would be such a bad thing, or whether the inclusion of a Hard difficulty setting by the developers would be too much to ask. Regardless, if we don’t see some realization of this fact from the developers soon, future Zelda releases may well prove to be nothing more than child’s play, and while Link himself is a child most of the time, the majority of his most dedicated fans are not.